to sort files, use: Preferences - File Handling - File sort order: Filename, natural sort; Filename natural sort, reversed. 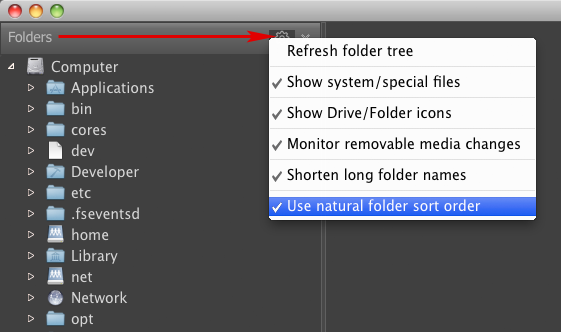 to sort folders in the Folders Panel: Folders Panel - (gear)Settings - Use natural folders sort order. Natural sorting is turned on by default, and for files it replaces the old Filename, alphabetical system. 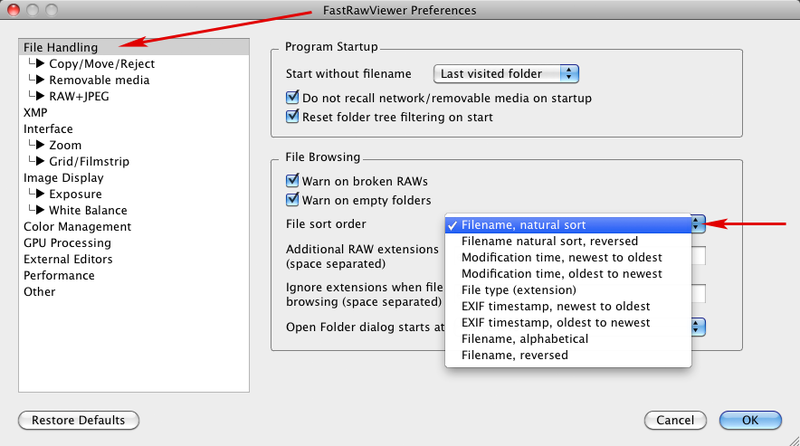 New setting: Other - Check global folders presence on startup (ON by default) turns on the checking for the existence of "global folders" if FastRawViewer is configured to use the said global folders. Hidden setting FilmstripSelectedItemContrast moved to the Preferences - Interface - Selected/active files contrast slider. This setting modifies the behavior of Shift-Click (selecting a range of files) in the Grid and Filmstrip. First limit of selected files range is always Shift-Clicked file. The Key/Mouse capture window is now very different from standard dialogs, and we hope that its contents will stand out better now. RAW files without an embedded preview: fixed the cases when "Decoding error" status was displayed in Grid / Filmstrip windows, instead of correct one, "No thumbnail"
Fixed internal/external JPEG orientation match if raw data processing is disabled for this file/data format. in RAW+JPEG mode, when files with the same names but different extensions are present, JPEG will be paired with a RAW file with the first extension, extensions being sorted in alphabetical order. That is independent of the sorting mode the user had chosen. fixed the sorting bug that occurred when files with the same names were present in a folder. when the primary sorting key is not unique, additional keys are used: file name (if the sorting was not 'by name') and file extension; additional keys ensure that the sorting of files inside a folder is stable. Fujifilm cameras BaselineExposure (Adobe hidden exposure correction) values are now in sync with recent Adobe software. 1) https://github.com/LibRaw/LibRaw/tree/xtrans-compressed This is an open-sourced SDK that apparently is superior in speed and ease of implementation. 2) FujiFilm themselves have an SDK that is made available to application developers (according to my sources it is free). My question, do you intend to provide this support in teh near future? I will likely keep using your product either way, but when I do use compressed files it will be easier to sort and weed if I base my selecting on teh actual raw files and not the jpg shot in tandem. We support Fujifilm X-Trans compressed RAWs since FRV 1.3.1 (minor bugs related to this format was fixed in FRV 1.3.6). 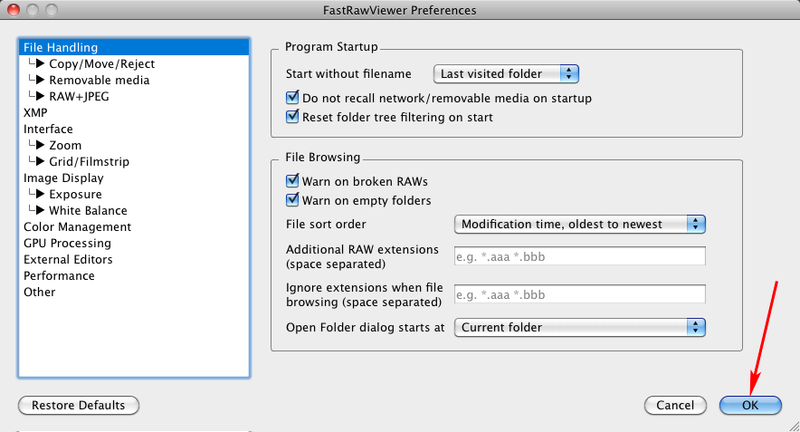 We support Fujifilm GFX compressed RAWs in FRV 1.3.9 (now in release candidate: http://www.fastrawviewer.com/blog/FastRawViewer-1-3-9-release-candidate). LibRaw opensource library you mention in 1st point is developed by our company, LibRaw LLC. Indeed, we use this library in FastRawViewer and RawDigger.